The TabbedMDIManager provides a new TabbedMDI layout mode as an alternative to the default Cascade and Tiled modes, like Visual Studio .NET IDE. 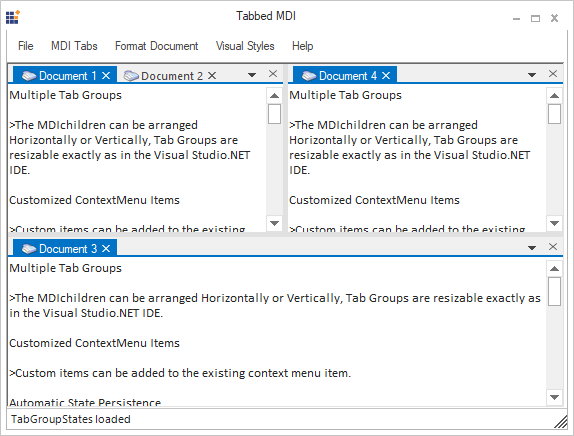 It offers tabbed groups support that allows the end-user to create multiple document interface (MDI) applications to display one or more tabbed windows in the MDI client area and complete customization option for the control. If an application contains more than one MDI tabbed group, the groups are separated by splitters. With a single function call, you can switch between TabbedMDI and RegularMDI layout modes. Tab Groups - Supports multiple TabGroups that can be resized with the help of splitters. It allows users to programmatically control and restrict the number and layout of the tab groups. Styling - Supports for wide variety of built-in themes like 2D, 3D, Metro, Office themes, OneNoteStyle, InternetExplorer7 and much more. Positioning - Tabbed windows can be arranged in different orientation such as horizontal, vertical, cascade, and inside the client area of the parent form. Tab Alignment - Supports to specify tabs alignment in left, right, top and bottom directions. Context menu - Provides a built-in context menu with options to perform operations like closing the tabs, moving tabs to new tab group and much more. We can also add custom menu items to the default context menu. MDI List - Provides options to retrieve the list of MDIChild forms in the application. And also the MenuItem or ToolStrip MenuItem to which the list should be added can be specified. Button support - Provides options to display close button individually for each tab. It also provides options to enable or disable DropDown and Close buttons in TabbedMDIManager. ToolTip - Provides options to show / hide ToolTip when the mouse pointer is placed over the tabs. Customization - Supports for customizing appearance of tabs and images. And also provides option to customize the DropDown and Context menus. Serialization - Provides serialization support to save and load the tab states.